The Windy City should have been renamed the Chilly City given the unspring-like weather during the show’s April 13–15 weekend. But really this was a blessing in disguise because a nice early spring day in Chicago would have meant the masses would have flocked outdoor somewhere rather than to an indoor audio show. AXPONA had a change of venue this year, to the Renaissance Schaumburg Convention Center Hotel. Renaissance, indeed! In addition to far more exhibitors than last year—to the tune of 165-odd demo rooms, plus the large expo hall—I noticed a broader demographic among the multitudes attending the show. I saw more couples, more women, and a greater than usual proportion of folks beyond the more typical Baby Boomer-male population. In addition to its new venue and explosive growth, this year’s AXPONA presented a couple of other anomalies. 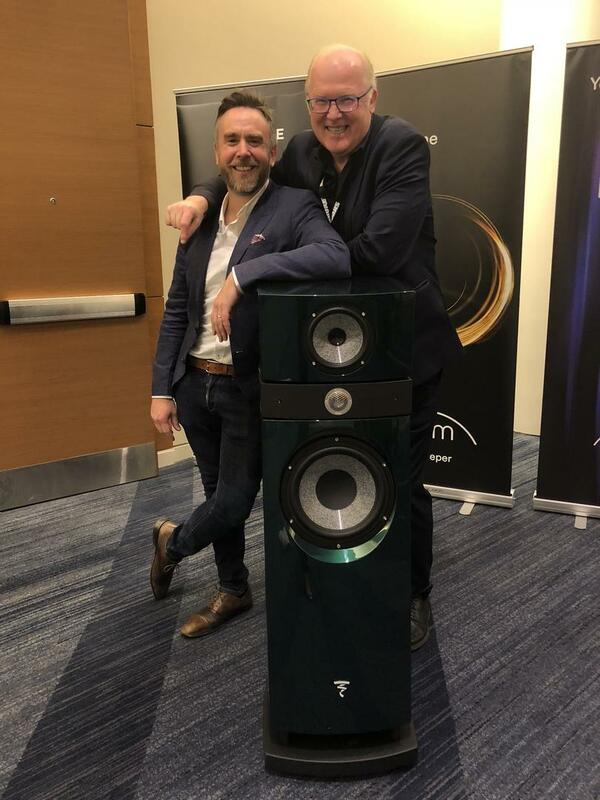 For one, I had extra big shoes to fill pinch-hitting for Jonathan Valin’s usual show assignment of big-league ultra-high-end loudspeakers, some of which enter the stratospheric price zone. Debuts took priority, and there were plenty of these. For another, this show’s size and scope exceeded expectations (and hyperextended our team’s bandwidth); therefore, listening time in rooms had to be curtailed. Apologies to those folks I inadvertently missed and/or did not get to return to visit (Nagra, Manger Audio, among others), but I’ll make sure to see you in Munich! 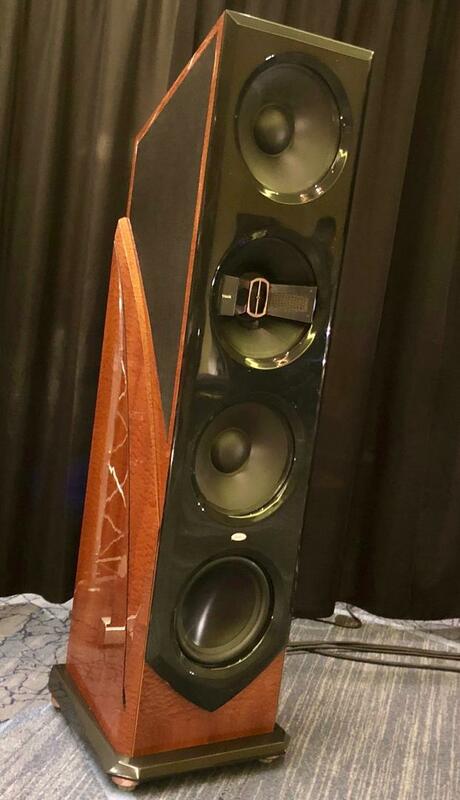 In the GTT Audio and Video room,YG Acousticspresented its Sonja XV Jr ($185.5k), a slightly more diminutive version of the company’s two-tower Sonja XV. But this four-way with two towers per channel isn’t the usual “baby brother,” nor is it a “trickle-down” in price or parts. Rather, it’s scaled down in size only and is identical to the original except that it has one less bass module per tower (across the four towers). The look and feel is quintessentially YG with heavy black enclosures. The Jr seems somewhat less imposing, though the woofer tower still gives a slight Darth Vader vibe. If this powerful speaker were a man, I’d call it virile, muscular. Why downsize? YG wanted to offer a model more suitable for smaller spaces without compromising performance, and cost considerations also came into play. Driven by Audionet’s Stern linestage and Heisenberg amplifiers and sourced on the analog side with a Kronos Pro Limited Edition turntable, this was another swell system with a touch of burnished warmth that can be inviting—as it was on Diana Krall’s version of “A Case of You,” where her vocals were rendered with a little extra smoky sensuality. Details were there, too: I believe I heard the piano pedal release at the end of the cut. MartinLogan co-founder Gayle Sanders, who was on-hand and extremely affable, unveiled the Eikon Image 1loudspeaker system ($25k)—the inaugural release from his new Eikon company—consisting of a pair of Image 1 active digital floorstanders and an Eikontrol “command center” containing a DAC/preamp and DSP processor that enables wavelet room analysis and custom configuration and EQ; eight channels of output and six inputs are on tap. Remote control is via a mobile app for iOS and Android wherein the sound can be further fine-tuned. Each speaker contains four dedicated monoblocks that are directly coupled and power each driver individually—an AMT Kapton ribbon tweeter, a treated-paper cone midrange with a half-roll NBR (Nitrile Butadiene Rubber) surround, and two opposing, time-aligned woofers. For now you can select any color so long as it’s piano-gloss black, but more finish options will be available later. Also forthcoming are user-programmable profile maps for various music styles and sonic preferences. The system is expected in market within “three or four months” after AXPONA. 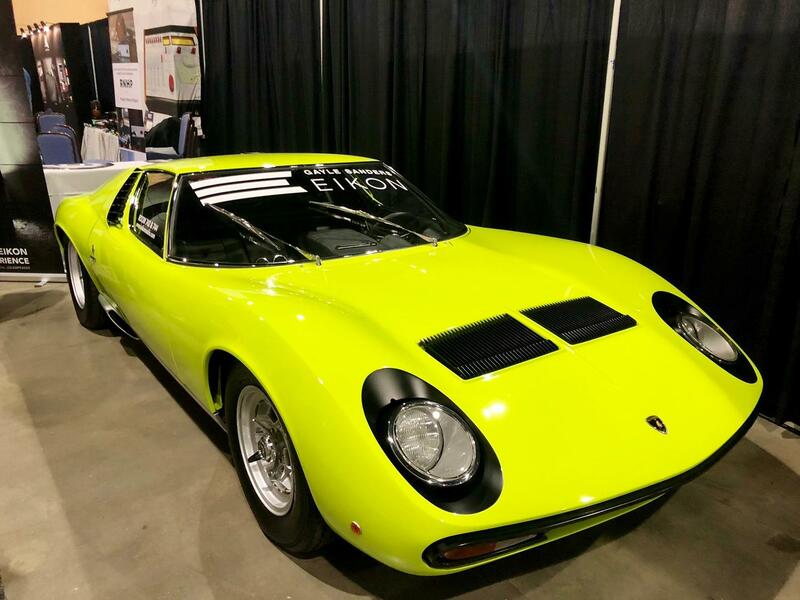 Finally, Gayle Sanders and Eikon deserve a shout-out for most creative “cross-promotion”: a bright lime-green Lamborghini with his namesake logo on the windshield in the Expo room (pictured below). 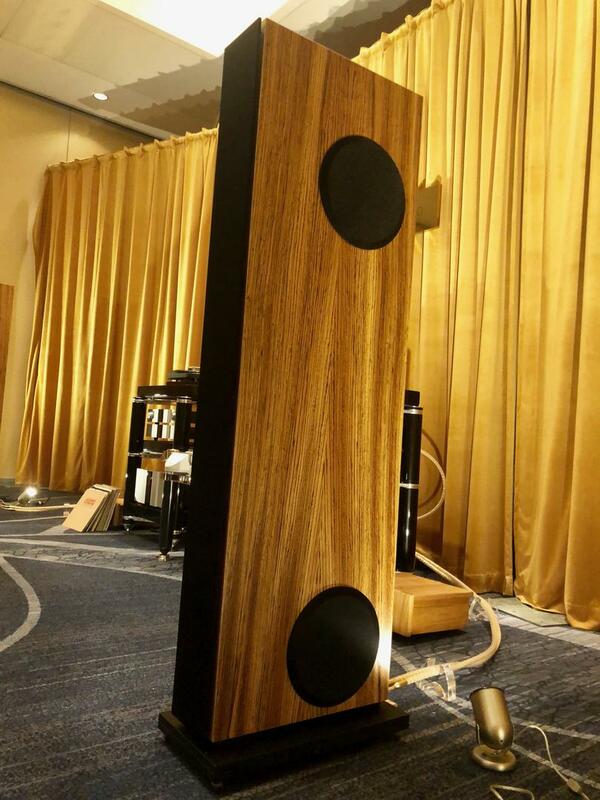 Legacy demo’d its new flagship Valor loudspeaker ($80k) clad in an attractive finish called “Natural Sapele Pommele” (it is also available in Black Pearl) and mated to the Legacy Wavelet processor, which serves as a DAC/preamp/crossover and correction unit and features the company’s Stereo Unfold Technology. The five-way Valor has a concentric midrange/tweet and dual air motion tweeters for the high-frequency soundwaves; in addition to the directly fired tweet, there’s also an “ambiance array.” The 125Wpc Raven Audio Silhouette MK2 monoblocks ($25,995) with eye and ear appeal drove the system. A digital file of McCoy Tyner’s “If I Were a Bell” from Land of Giants had powerful snap on upright bass strings—and quick transient attacks overall—as well as substantial low end. Imaging and timbre on piano and xylophone registered as quite natural-sounding. Ultra-high-end German manufacturer Göbel High End debuted its Epoque Aeon Fine loudspeaker ($140k) that features a unique bending-wave driver, the Göbel Carbon Excellence whose patented proprietary design is said to deliver perfect 180-degree dispersion in-phase on both sides; the transducer reportedly runs full-range from 170Hz to over 30kHz. 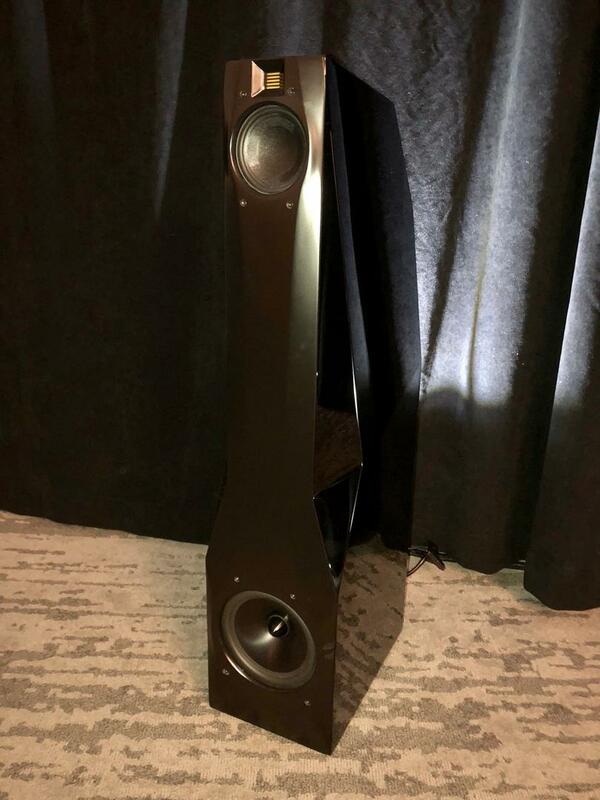 JV and I had seen and heard the prior full-scale iteration of this speaker, the Epoque Reference, at the High End Munich show a couple of years back; this is its “younger brother,” representing the first revisions in six years. Updates include improvements to the bass and bending-wave drivers, redesigned crossover, upgrades to parts materials, and the addition of mechanical coupling of the feet. The smooth, elegant enclosures are made of a solid aluminum top portion and a 101-layer-thick composite material CNC cut with a diamond tool for a look as seamless as the sound they reproduce. With 90dB efficiency and plenty of power courtesy of CH Precision’s C1 linestage preamp and M1 stereo power amp, demo source material (digital only) was rendered with remarkable purity, transient speed, and high resolution in a slightly top-down tonal balance on Buddy Guy and “Beyond the Dunes” from Brazilian acoustic guitarist Peppino D’Agostino (no relation to Dan). Piano was reproduced with a pleasing sense of effortlessness, coherence, and natural clarity. Cabling was also from Göbel. 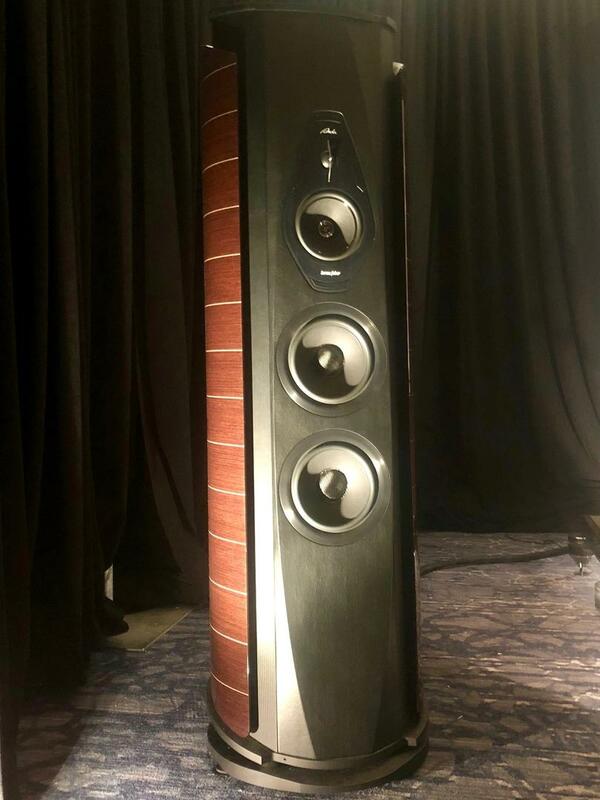 An updated version of the mighty Von Schweikert Audio Ultra 11 loudspeaker ($295k) with VSA’s Shockwave V12 subwoofer (used for active room correction) was presented in bold fashion by The Audio Company of Atlanta. 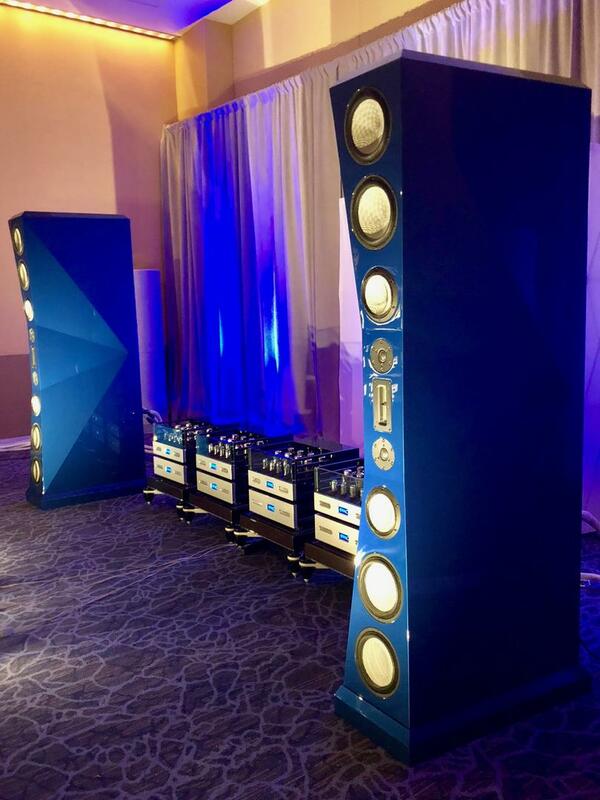 A wide array of gorgeous tube Valve Amplification Company (VAC) electronics drove the latest behemoth D’Appolito towers—in blue (a custom color option) this time—to new heights of dimensionality and bloom: two pairs of VAC Statement 450 iQ monoblock power amps ($295k/pr. ), Statement Line Stage ($80k) and Statement Phono Stage ($75k). Updates to the Ultra 11, which I was told is maintaining its current name (original Ultra 11s can be upgraded), include a completely redesigned crossover network and brand-new Accuton midrange drivers. Autoformers are used in place of resistors to avoid impacting tonal balance; adjustments can be made in full 1dB steps. Many fine-tuning options are available via a multitude of knobs on the enclosure backs. Phase can be adjusted 180 degrees. In addition to their gargantuan height, the 14-driver, six-way towers are also hefty: Their enclosures contain strategically placed 1-inch-thick stone composite material. Their sound? Big. A listen to London Grammar’s “Hey Now” played back on the analog setup—Kronos Pro turntable with SCPS-1 power supply ($13.5k), Black Beauty tonearm ($8500), and Air Tight Opus One cartridge ($15k)—yielded how-low-can-you-go bass (albeit with a few rumbles) and a spacious soundstage in both depth and height; the staging on my Gerhard Decca LP (on “Libra”) was the most expansive I heard at the show. Also on tap were exciting attacks, compelling imaging, solidity, and high resolution (even if it was not always the pinnacle of transparency, musicality was a constant). On “Sweet Home Chicago” from my Taj Mahal LP, an ORG reissue, hard-hitting transient attacks—as his guitar strings were pushed nearly to the breaking point—were thrillingly conveyed. The huge ballroom hosting the system fit the bill for the setup’s powerhouse—and at times explosive—sonic output. This, uh, extreme system was connected by MasterBuilt Audio cables and was supported by racks and amp stands from Critical Mass Systems. The sky’s the limit! A BOS contender. The Kubotek Corporation of Japan introduced the Haniwa loudspeaker system; that is, a pair of the HSP01 speakers (and stands) plus the HDSA01 digital control amplifier ($22k for both). These unusual-looking full-range speakers feature a single 3-inch magnesium driver and sealed enclosures made of dense laminated MDF that are 3-D machined. Their form-factor resembles a little jet engine with a point source instead of a propeller in the center. Dr. Kubo is longtime believer in HP’s sonic principles of “the absolute sound”—he even owns a number of LPs from HP’s vast collection, some of which were in the room and have been digitized and were played back as source material—and designed the entire demo system from cartridge to speaker with the goal of achieving precise imaging from the single-driver system. His “Haniwa Approach” aims to precisely control the waveform in both the frequency and time domains by tuning the electronics to the speaker. Indeed this quick and coherent setup delivered a natural tonal balance with realistic timbre on acoustic instruments. There was lovely detail and delicacy on a few tracks from The Weavers at Carnegie Hall. The presentation offered nice resolution and transparency, though the speaker’s smaller profile scaled down soundstaging dimensions—as would be expected. A fine-sounding little setup. 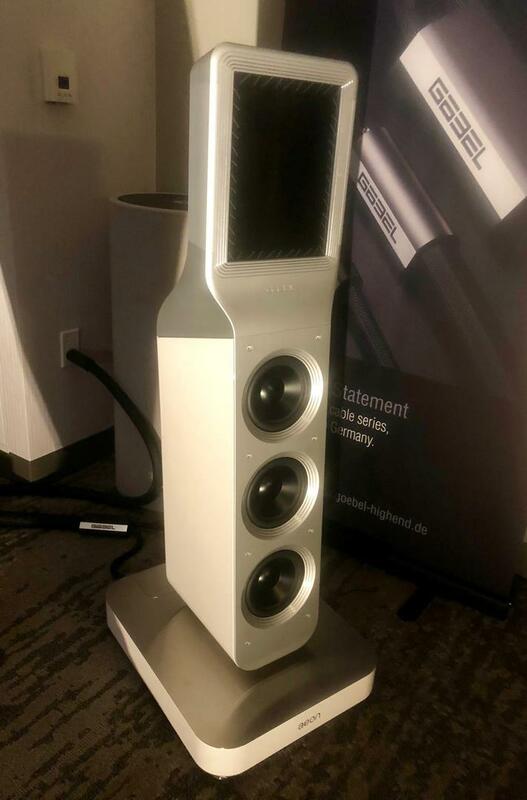 Fidelis Music Systems demo’d the Swiss-made Stenheim Alumine Five ($50k) three-way in its North American debut in a setup with the new VAC Sigma 170i integrated ($9995), the new Acoustic Signature Double X turntable ($5795), and the MSB Analog DAC ($9950), among other gear. 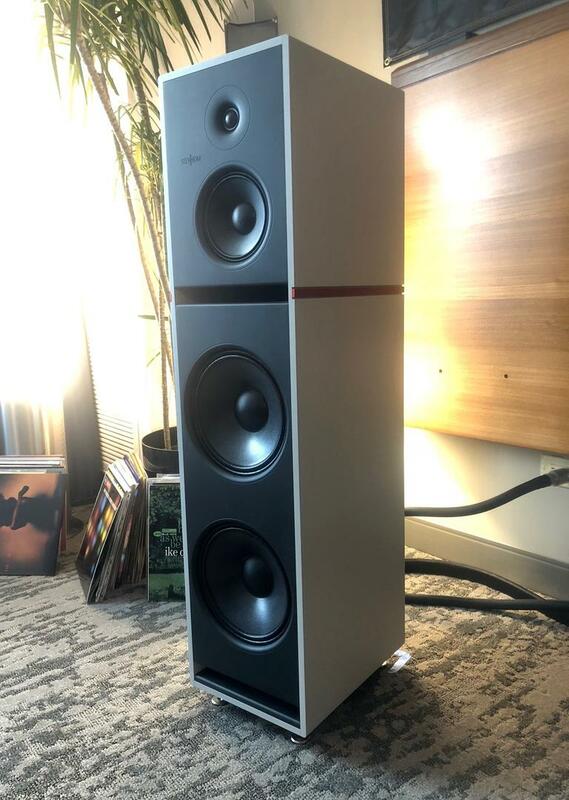 Although the 94dB-efficent floorstander sports a solid-aluminum enclosure (in dove grey with a red stripe) with a boxy aesthetic, its looks belie its sound. In other words, you’d expect it to sound heavyish but no, it’s quite fast and nimble on attacks with an open spaciousness between instruments and high-resolution musicality across myriad sources. Focal displayed a couple of eye-catching new finishes: its Scala Evo Utopia ($40k) in British Racing Green (pictured above), and on a Sopra No. 3 ($20k), a custom “Chameleon” color (a kind of iridescent effect shifting between maroon and dark green) especially for the show. Other new hues include Ash Grey, Carrera White, and an (as yet unnamed) blue. 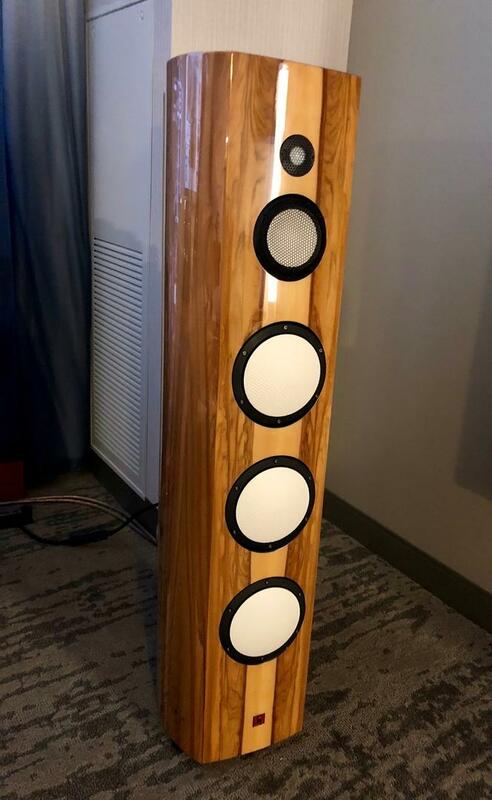 Axiss Audio presented a duo of demo rooms, one showing Air Tight 3211 tube monoblocks driving the handmade-in-Switzerland Piega Coax 711 three-way loudspeakers($25k) recently reviewed by RH. The 711s feature the company’s unique coaxial ribbon tweeter/midrange and four mid/bass cone drivers in an aluminum cabinet. Trying out a couple of the EQ curve options available in the Air Tight ATE-3011 Reference phonostage—RIAA and Decca—added even more fun to this demo; on-hand was a circa-1949 Decca LP of Lalo’s Symphonie Espagnole. This was rather neutral-sounding system that had plenty of bloom, instrumental texture, and musicality, in part thanks to those tubes. A good match of speakers and amps. Guilty pleasures abounded in the Scott Walker Audio/Synergistic Research demo in a big ballroom (Schaumberg D) on the second floor, complete with massive chandelier: Huge sound filled the huge room in a blockbuster system featuring the excellent United Home Audio Ultima4 tape deck ($22k; outboard power supply $6k) connected to Constellation electronics rocked the hell out of the Magico S5 Mk II speakers (I’d never heard them sound quite like this before!) on track after track. All cabling, power conditioning, grounding, room treatments, racks and shelves were from Synergistic. Another bonus: bars of Vosges chocolate, a local fave. Due to time constraints I took advantage of this room’s extra after-hours listening. There was so much muscle and impact behind the music, you could almost feel the soundwaves several feet away. Bass was big and hard-hitting on “Burning Down the House” from Talking Heads’ Stop Making Sense. The goosebumps I got during Hendrix’s “Little Wing” and Janis Joplin’s “Maybe” had me thinking accuracy, schmaccuracy. The Voice That Is demo’d the Tidal Piano G2 two-and-a-half-ways ($42.9k) with diamond tweeter and a black-powdered ceramic midrange transducer (Accuton custom). The real wood used for the veneer is hand-matched in grain patterns, so each is unique—and requires 40 lbs. of polyester and eight months to finish. Given the marque’s price-points and handmade-in-Germany reference quality one wouldn’t call it entry-level. Doug White explains it’s not compromised, only scaled down in size. Driven by Tidal electronics, this setup is intended to be a full starter system for (well-heeled) customers who want to get into the Tidal sound. MBL demos are a treat. This time MBL North America’s Jeremy Bryan and his wife Tara presented two systems in as many rooms, but alas I only had time to soak up some omnidirectional waves from those fab four-way German-made 101 E MKII Radialstrahlers($70.5k)—one of the high end’s most unique designs and sonic experiences—driven by the maker’s latest electronics. Jennifer Warnes’ version of “Bird on a Wire” was rendered with speed and impact combined with effortless bloom, detail, dimensionality, and musicality. A guy behind me said, “He always has a great-sounding room.” Yep. Speaking of great-sounding treats, the sound of the exotic Avantgarde Acoustics Trio XD system with four basshorns ($148,700) driven by Esoteric Grandioso electronics kept beckoning me into the room for a few one-song stops: Pink Floyd’s “Another Brick in the Wall,” Thomas Dolby’s “The Flat Earth,” and a bit of Mahler’s Fifth. Some say the room might have verged on too small for the setup but no matter—these horns’ unmatched immediacy, speed, and unimpeded transmission of fine detail was utterly delightful and captivating. I’m sad to have missed the after-hours listening here. 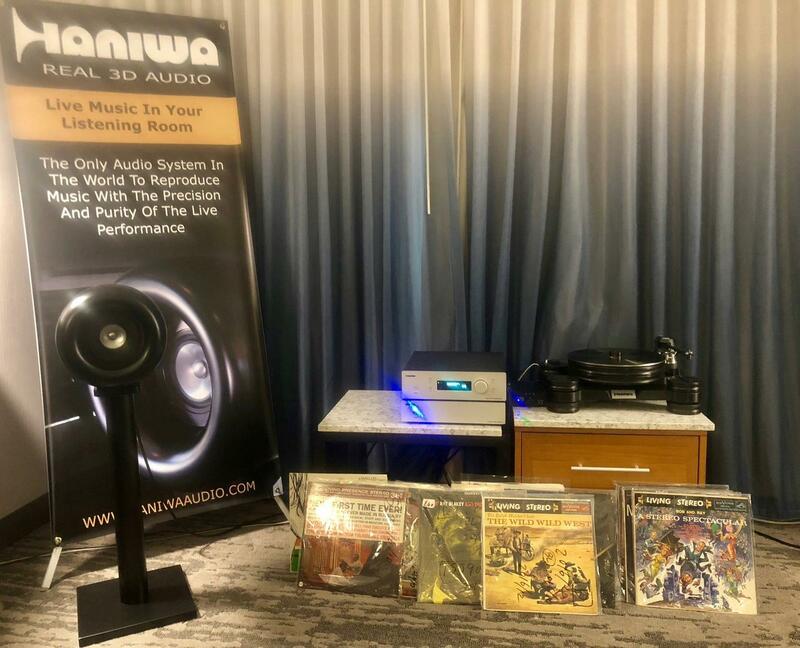 Wynn Audio showcased the easy-on-the-eyes-and-ears Penaudio Sinfonia flagship ($27k), a three-way D’Appolito floorstander powered Karan Acoustics KA M 2000 monoblocks ($59,995/pr. ), in a nicely appointed Utopia C ballroom setup. The Paragon Sight and Sound rooms presented plenty of top-tier gear to pleasing effect. 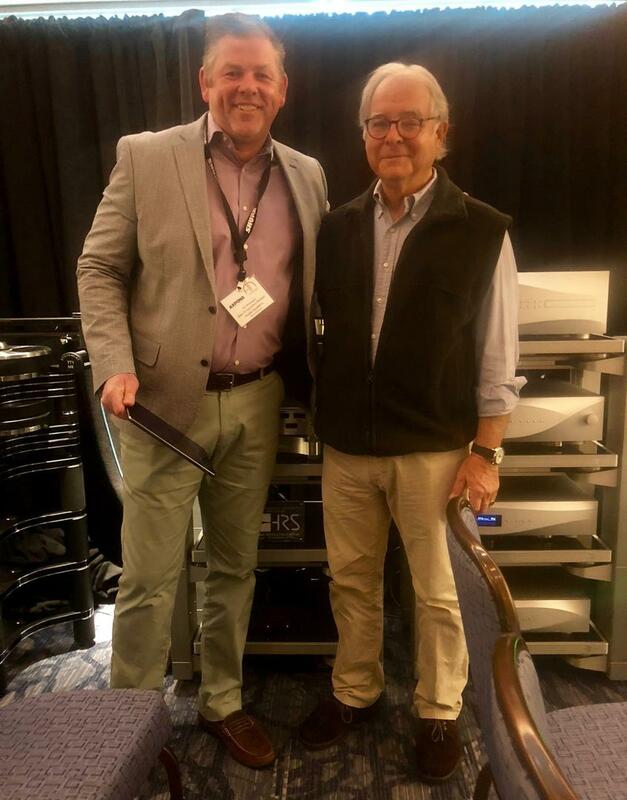 A shout-out goes to Peter McGrath of Wilson Audio (who was on-hand in this room) for taking me through a remarkable MQA demo of some of his own classical recordings (PCM), which we listened to via Wilson Alexandria XLF speakers ($209k) powered by D’Agostino Momentum series electronics—both with and without the technology. Once again (at least given this material and some other I’ve heard) I could say what a difference a codec makes—as if a veil had been lifted revealing a more expansive sense of space, soundstaging, energy, microdynamics, and more. 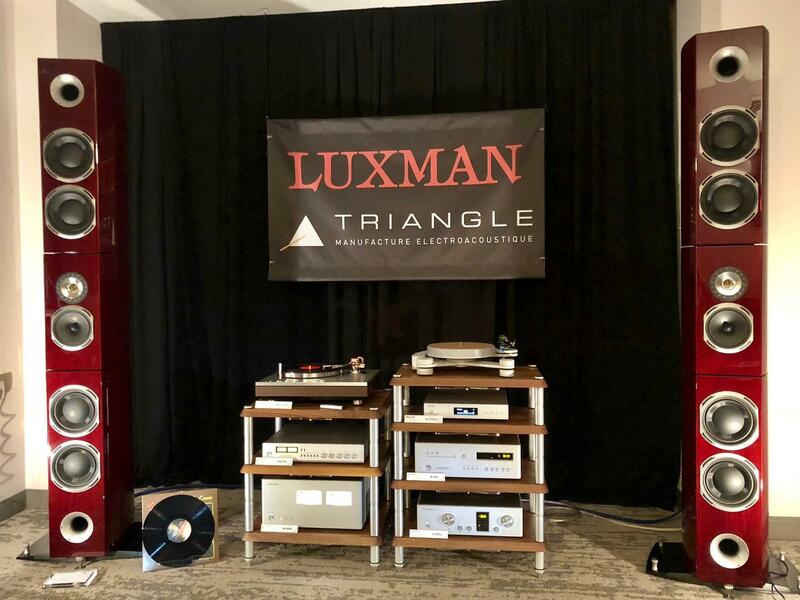 In another fine-sounding demo, a stack of Constellation electronics drove the MartinLogan ESL 15A Renaissance hybrid electrostatic loudspeakers ($25k) in a striking crimson hue. The ever-amenable Irv Gross spun LPs on a Continuum Audio Labs Obsidian turntable with Vipertonearm ($45k). MartinLogan’s “Turning unused space into better bass” tagline rang true here on a couple of cuts from the MoFi reissue of The Pixies’ Doolittle. 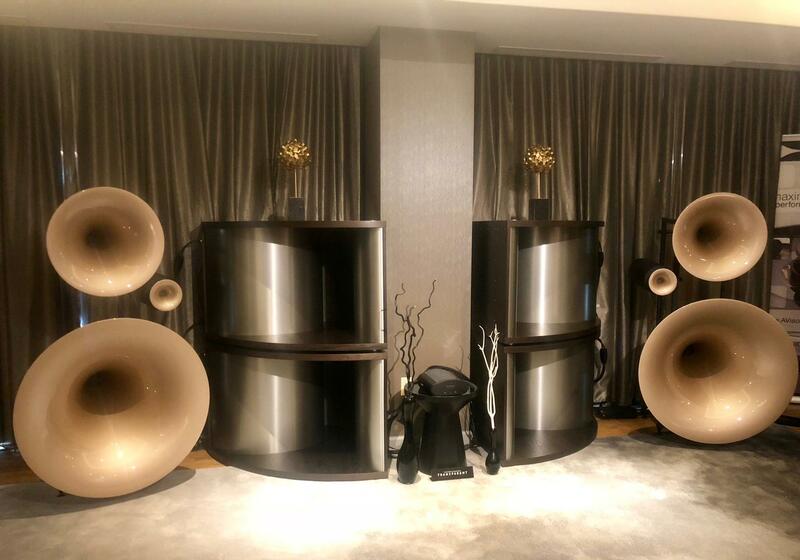 French manufacturer Triangle presented its eight-driver, three-way Magellan Grand Concert ($70k) flagship with a pair of horn-loaded tweeters with waveguides and paper midranges—one of each rear-firing—and multiple inverted woofers made of a wood and polymer composite. 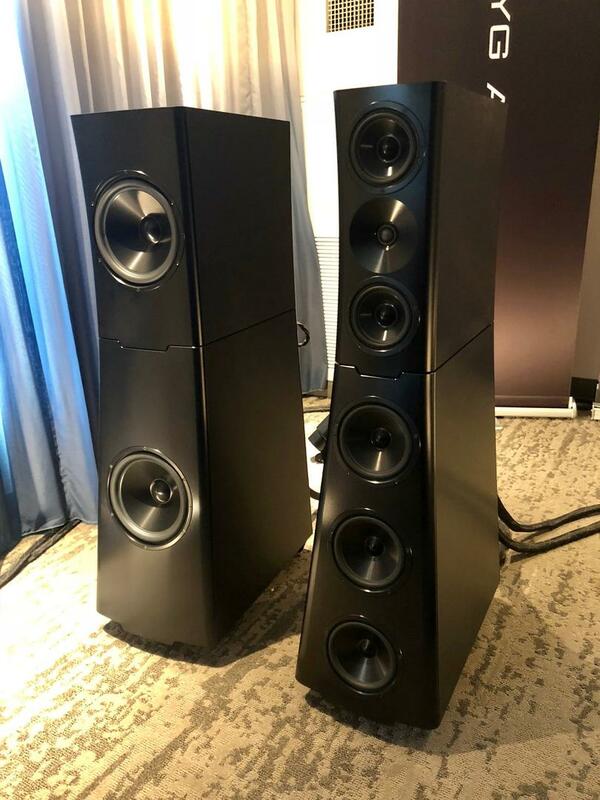 Although the small room was not ideal for a speaker of this size and scale, these towering towers displayed compelling transparency, tonal naturalness, and openness. A listen to my vintage Decca LP of Gerhard’s “Libra” exhibited impressive imaging, spacious soundstaging, and a true sense of air between the instruments adding up to an ear-pleasing experience I was ready to relax into. What struck me most was how freed-up the system sounded, especially given the number of drivers in play. On a practical note, these tall towers come in three sections to ease installation. A pleasant sonic surprise, and a BOS contender. 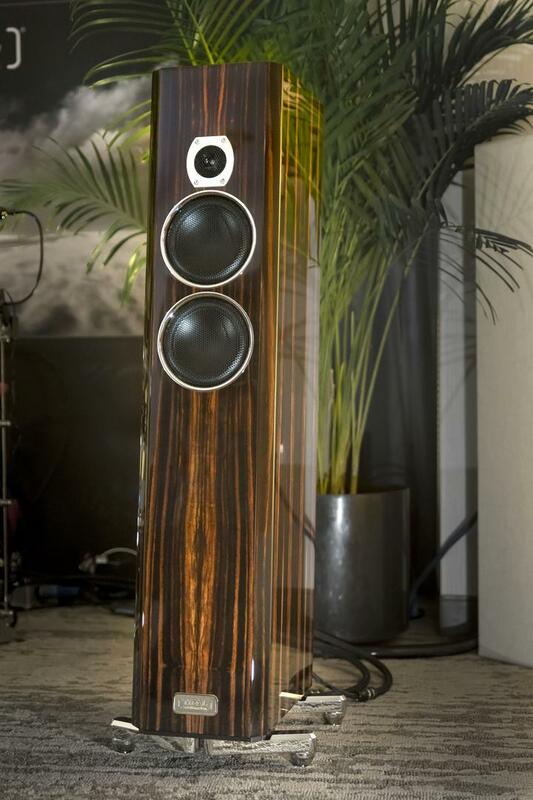 The Lumenwhite Kyara loudspeaker ($49,900) was presented in a striking French Nut wood veneer finish. The drivers, all custom-designed, include a 1-inch ceramic or diamond “cell” tweeter, a proprietary 5-inch “cell” ceramic midrange transducer, and three 6.6-inch “cell” ceradome woofers. Ahead of these three-ways were tube electronics and digital sources from Ayon Audio—adding up to a superb-sounding and detailed demo that I wish I’d stayed longer to enjoy. 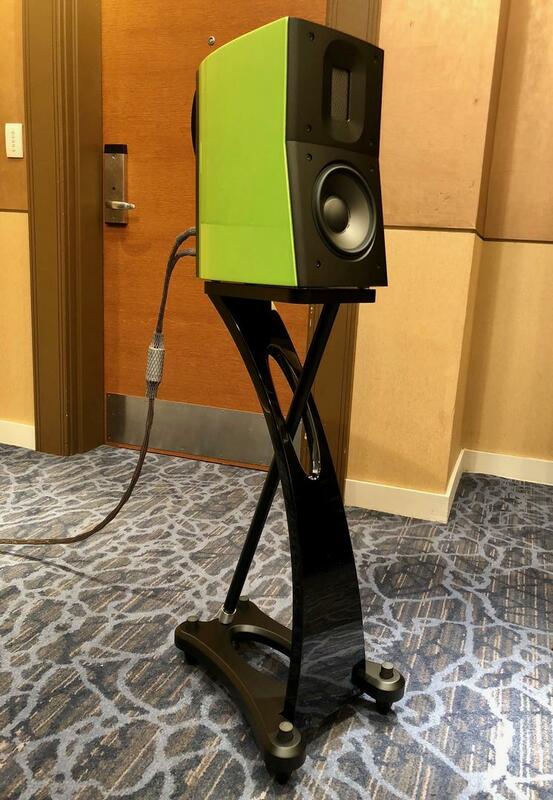 Next Level Audio exhibited the exemplary Raidho D1.1 stand-mounted two-ways with recent crossover upgrades ($28,750 in black)—in an eye-popping lime green (~$30k, pictured above)—in a demo paired with the new Aavik Acoustics U-150 integrated amplifier and Ansuz cabling. (For more on the Aavik amp, see Greg Weaver’s show report.) This system offered full, rich sound balanced with high resolution plus substance and musicality…on digital playback no less. Super sound for smaller spaces. Too many speakers, too little time…I don’t feel I had sufficient listening time to determine this fairly but a few standouts were the Avantgarde Acoustics Trio XD system with four basshorns ($148,700) powered by Esoteric Grandioso electronics; another was High Water Sound’s room with Horning Aristotle Ellipse speakers ($16k) with Arte Forma tube electronics and TW-Acustic AC/3 turntable source; and yeah, those knock-em-dead VSA Ultra11s with VAC electronics packed a punch. The “game-changer” cliché is overused but it applies to the show-stopping $9800 Magico A3. For even less coin, Elac once again delivered the sonic goods with its new DB-62 speakers ($300). A tie: The buzzworthy Magico A3 and Gayle Sanders Eikon Image 1 loudspeaker system. The creation of “little brother” versions of ultra-high-end loudspeakers to suit smaller spaces. More color and “lifestyle” finishes available for loudspeakers: Focal, Raidho, Gryphon, Avantgarde Acoustic, etc. Audiophiles, hi-fi fans, and music lovers of a wider age range than usual attended the show. That crazy Avantgarde Acoustic horn system in its big-time colorful splendor. The Stein Audio Bobby loudspeakers. And some Magico A3s wouldn’t hurt.